Orthodontics – The Minimally Invasive Way to a Perfect Smile! With over 25 years experience in fixed – band orthodontics, we are ideally placed to help you straighten your teeth! Orthodontics involves the use of brackets and wires, temporarily stuck to the teeth to allow us to move the teeth – to straighten them if irregular, to close gaps, to relieve crowding and make a pleasant, regular smile. 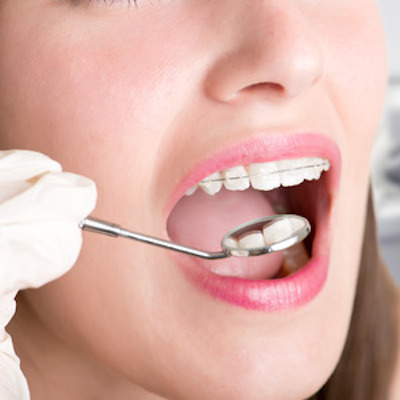 Most people are aware of orthodontics for straightening their childrens or grandchildrens teeth, but orthodontics can be used to straighten anyone’s teeth, no matter how old, as long as the gums are in good condition. If you are considering having veneers or crowns to improve your smile, we will often suggest orthodontics instead as being the better way. It is not destructive of the teeth, feels and looks more natural and is significantly cheaper. Combined with teeth whitening and modern composite bonding, most people will benefit MORE from orthodontics than from veneers! Most adult cases are finished within 1 year, some in as little as 6 months. Orthodontics can also be used in combination with other procedures such as implants or crown and bridgework. We are uniquely placed in being able to offer such treatment combinations. While most adults can be treated at any time of life, children are best treated after all the primary (milk) teeth have fallen out, usually at age 10 – 12. Although many practices in Spain like to start treating children early, there is no evidence that this is beneficial. We like to wait until a child is mature enough to undertake the required tooth brushing, and keen and eager to have the treatment. Orthodontics with fixed braces costs from €1500 per jaw. All orthodontics is payable as treatment progresses after payment of a deposit, and includes 1 set of retainers, which are necessary to keep the final result.